Sion 2026 will hope that an endorsement for their Winter Olympic and Paralympic plans from the residents of the proposed ski jumping venue bodes well for a crunch referendum tomorrow which will effectively determine the bid's future. 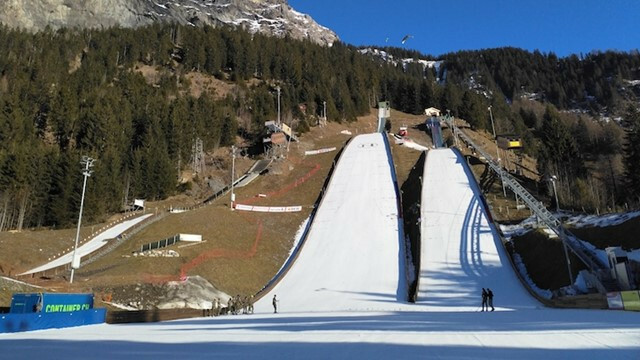 The inhabitants of Kandersteg, which lies in the canton of Bern rather than Valais, voted at a townhall meeting to pledge funding of CHF 1.2 million (£910,000/$1.2 million/€1 million) to renovate the jumping hill and proposed Nordic combined site. According to swissinfo, only one voter present publicly opposed the plan amid many messages of support. "Tonight, a very large majority of the residents of Kandersteg acknowledged the added value of doing some minor renovation and construction work on a sports venue which is of great economic importance for the region, and that makes me very happy," said Sion 2026 vice-president Hans Stöckli, a Bern Senator. "With this positive vote, Kandersteg confirms that it wants to be part of the Sion 2026 Games concept and that its residents believe in the positive impact of the Games. "This vote bodes well for Sunday’s vote in Valais. "I truly hope that the people in Valais will be as enthusiastic as the residents of Kandersteg and that they look into the future with trust and optimism." The referendum tomorrow in Valais canton - the proposed centre and site for most other venues - directly concerns whether to release funding of CHF100,000 (£76 million/$101 million/€87 million). In reality, however, a "no" vote will effectively mark the end of the bid as there would be no chance of holding it in Sion. The referendum will be held alongside nationwide votes on the Sovereign Money Initiative proposal and on the Federal Gambling Act. This means that voters will not just be going to the polls to make a choice on the Olympic project in something that, the bid hope, may play to their advantage. A poll released in May found that 46 per cent of voters in the region would vote "yes" in support of the bid in comparison with 47 per cent who would vote "no" and seven per cent who are undecided. A latest poll conducted by Sotomo for RTS Swiss Public Television indicated that 51 per cent would not approve the funding of CHF100 million to organise the event, and a further seven per cent would probably not approve. In comparison, 36 per cent of those asked said they would vote "yes", while a further six per cent said they would probably vote in favour. Frédéric Favre, another Sion 2026 vice-president, has claimed to be optimistic before a "tight" vote. He also claimed that the pessimistic recent poll cannot be relied upon because it was conducted only through the internet. "There was an important democratic debate around this Olympic project, it has been long," he told Francs Jeux. "The campaign started last year with the first televised debates. "It was normal to go through such a long campaign, because the issue justified it. "But today, we want the result. "I am optimistic, but I feel that the outcome of the vote will be tight." Favre admitted that, "in case of no victory, we would withdraw from the association for the Games in 2026". "I am an elected representative of the people, I respect the democratic choice," he added. "It will be up to the authorities in Bern to decide the issue. "It is not written anywhere that Switzerland's candidacy necessarily implies Sion and Valais, but the project has always been built around Valais." A referendum has not proved successful over an Olympic bid since a 2013 one narrowly in favour of an Oslo bid for the 2022 Winter Olympics and Paralympics which collapsed anyway soon after. Innsbruck in Austria became the latest city to suffer such a defeat in October, killing their bid for 2026. A total of 60 per cent of residents in the Canton of Graubünden also voted against a former rival Swiss 2026 bid. A referendum for a 2022 bid from Davos, also in Graubünden, was similarly unsuccessful, as was one in Kraków in Poland and Munich in Germany. The IOC have attempted to reduce the cost of bidding and hosting through their "New Norm" reforms, but are also trying to claim that the Sion referendum is not just about the value of the Olympic Games. "What I think we will see on Sunday is the result of a vote in which the question is not do you wish to organise the Games or not, it's a question about the Canton of Valais investing CHF100 million in different infrastructures, some of which would be used for the Games, which is a different question," he told insidethegames last week. Calgary in Canada is also likely to face a referendum late this year or early in 2019, while Stockholm in Sweden and an Italian bid from Milan, Turin and Cortina d'Ampezzo are still not guaranteed political support. That leaves Erzurum in Turkey, which is currently considered a rank outsider, as well as Graz in Austria, the country where the referendum in Innsbruck has already failed, and Sapporo in Japan, which would prefer to bid for the 2030 edition instead. The IOC is due to approve official candidates at its Session in Buenos Aires in October before a host is chosen in September 2019.